Opt for a utility cart for establishments with smaller area space. Feel free to stock your shelves without obstructing your aisles, so you can work freely during open hours! Add extra shelves to your utility cart to fully capitalize on each trip! 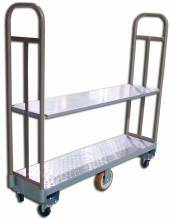 Great for supermarkets and food service establishments, these durable steel utility carts are a great addition to any business.